Staying on top of the latest innovations in medical technology has proven very helpful because this allows patients to receive the highest level of care possible. Dr. Semente provides his patients with several of the latest diagnostic technologies right here, in office. If you are looking for an up-to-date chiropractor in St. James, click here to contact our office today for an appointment. Involves using a computer and a digital myograph to measure the amount of force generated by the contractions of the muscles. The results give the chiropractor an idea of how well your muscles are functioning so that he can plan out an individualized rehabilitation program specific to your needs as a patient. Takes x-ray and CT scan results to the next level, proving the functionality or lack thereof as shown in scan results. For more information on Neuromuscular Testing, click here. 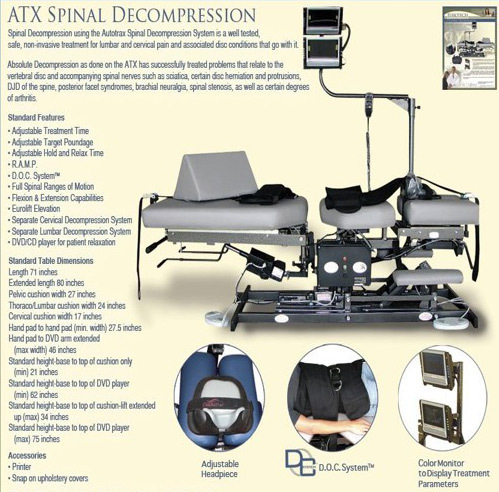 Dr. Semente is a chiropractor in St. James that offers the Autotrax Spinal Decompression Therapy table that uses a computer to target particular discs in order to decompress them. This specific therapy requires a separate consultation, so be sure to notify us that you are looking to receive this treatment when you make your appointment. Used in worker’s compensation and motor vehicle accident injuries to quantify impairment. The computer that is used to produce the unbiased results also shows how much your range of motion deviates from a normal range of motion. For a chiropractor in St. James that uses this specific technology in-office, contact us for an appointment here. The EMG provides measurable data about your nerve function or dysfunction. The instrument used measures the electrical currents within the targeted muscle to show how much or how little damage has been done to the nerve, by observing abnormal wave patterns. Nerve conduction velocity tests provide results that can indicate abnormal pressure on the nerves and even nerve disease.This test is particularly useful in proving the presence or absence of carpal tunnel syndrome. Evoked potential tests nerve pathways through electrodes connected to the skin. We provide x-rays to detect misalignment of the spine right from the comfort of his office as a chiropractor in St. James.